Except, as it turned out, it wasn’t. In the time it took to make a bank deposit, the tenure of the longest-serving head coach in the National Hockey League came to an abrupt, startling end. The Lindy Ruff era was over. For the first time this season, I (and I would venture to guess most of Western New York) felt a sense of sadness for the man who’s been in charge of the Sabres bench for the last 15 years. Yes, it was certainly time for a change of some kind. After going just 6-10-1 in this greed lockout-shortened season and dropping a 2-1 decision on Tuesday to basement-dweller Winnipeg, the blue and gold faithful were at a tipping point. Something had to be done, and it had to be done right now. Whether that something will prove to be the right decision is perhaps the biggest uncertainty in Buffalo right now. What is certain, however, is the legacy Ruff left behind. Two years after he was hired by the Sabres in July of 1997, he led the team to their second-ever appearance in the Stanley Cup Finals. Had it not been for Brett Hull’s (still to this day) controversial triple overtime “skate in the crease” goal (or NO GOAL, depending on who you ask), the Sabres very well might have hoisted hockey’s holy grail in June of 1999. After the (2004) lockout, Ruff led his team to back-to-back conference finals. This included a very memorable contest in 2006 during which then-rookie Jason Pominville scored a shorthanded, overtime goal to clinch the series against Ottawa. That same year, Ruff won the Jack Adams award for the NHL’s Coach of the Year. In 2006-07, the Sabres won, for the first time ever, the Presidents’ Trophy under Ruff’s leadership.Unfortunately, that’s when things began to slide. The Sabres failed to qualify for the playoffs in 2008, 2009, and 2012, and were eliminated by archrivals Boston and Philadelphia in the first round in 2010 and 2011 respectively. After a 2-0 start to the 2013 season, the team has since frankly looked lost, slow, and lazy on the ice, especially defensively. It is indeed quite the odd feeling losing a coach who seemed like he’d be here forever- a mix of shock, disbelief, sadness, relief, and hope, among others. I grew quite fond of Lindy during his time in Buffalo, and I’m sure that he won’t stay unemployed for long. He’s a tremendous head coach and an even better person, and I’m sure we’ll see his name hoisted into the rafters of First Niagara Center sooner than later, and justifiably so. Since the Sabres’ inception in 1970, Lindy has been a part of 24 years, or 65 percent of their history as a player and a coach. So now, as a community, and as a team, we move on. 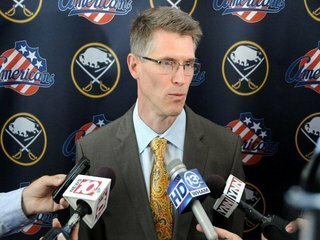 Ron Rolston, the now-former head coach of the AHL Rochester Americans, will take over Ruff’s duties in the interim, but yesterday’s actions certainly don’t solve all of the Sabres problems. Buffalo seemingly has more defencemen than the Pentagon, yet they can’t seem to find their stride. If not for the outstanding performance of Ryan Miller night after night, the team might be in an even worse position than they are now. With a few exceptions, the team seemingly lacks the heart to get the job done on a consistent basis. Addressing the media for the first time as Sabres head coach this morning, Rolston commented that many players seem to enjoy taking shortcuts that aren’t working. If the Buffalo Sabres want any chance of a playoff berth, they need to understand that victory comes from hard work, consistent effort, and the drive to succeed, no matter what that entails. 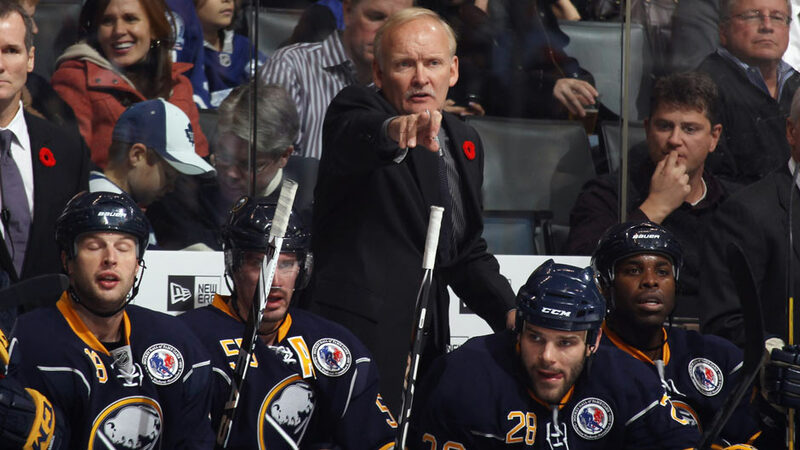 And so Buffalo bids adieu to Lindy Ruff, at least for now. I’ll remember Lindy Ruff as part of the reason why I became so impassioned with hockey–some of my life’s most memorable moments have come watching his team play, and I owe him a massive amount of gratitude for that. United under the blue and gold flag, Sabres Nation raises our collective hockey sticks to you. Thank you, Lindy Ruff. 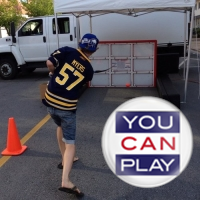 This entry was posted in Buffalo Sabres and tagged Buffalo Sabres, First Niagara Center, Jason Pominville, Lindy Ruff, Ryan Miller. Bookmark the permalink. Anyways, being from Winnipeg, also a smaller city, I feel your pain of losing such a great community figure. He’ll be back, there’s no doubt about it, even if it’s later in his career. Imagine that when Lindy got the job, Phoenix had just finished its first-ever season in the NHL.. bastards! Thanks for a thoughtful article. RESPECT for Lindy from this Bruins fan. As a Caps fan, all I’ve known for years is a coaching carousel. It always made me smile to see Lindy behind Buffalo’s bench night after night. Glad to see his team’s recent struggles haven’t overshadowed his legacy in Buffalo. And I love that “Thank U Lindy” picture at the end. Awesome.